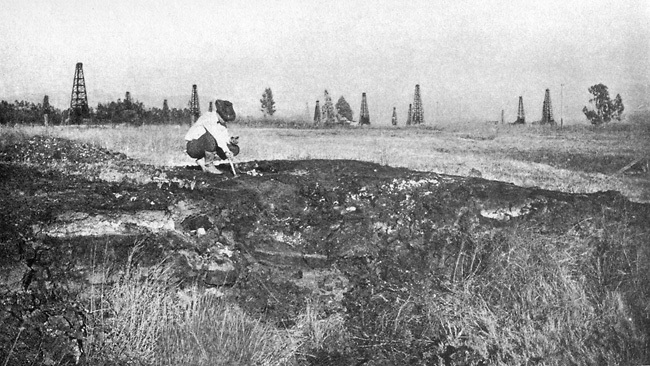 When the photograph below was taken, the location depicted was described as "the Salt Creek oilfields, 7 miles west of Los Angeles." Today, this spot is in the middle of downtown Los Angeles, eloquent testimony to urban sprawl, but the pools and deposits of asphalt still remain. 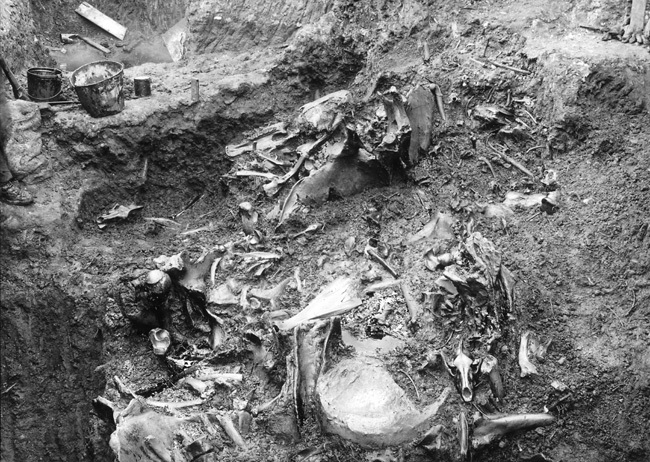 For these are the La Brea tar pits, containing one of the richest, best preserved, and best studied assemblages of Pleistocene vertebrates, including at least 59 species of mammal and over 135 species of bird. The tar pit fossils bear eloquent witness to life in southern California from 40,000 to 8,000 years ago; aside from vertebrates, they include plants, mollusks, and insects  over 660 species of organisms in all. This photo from Rancho La Brea appeared in the November 9, 1911, Memoirs of the University of California. The caption reads "The locality at which the principal excavation work of the University of California has been carried on. The exposure to the left shows separation of distinct strata. The small white patches in the asphalt represent weathered bones still in the original matrix. Photograph by Ralph Arnold." An incredible mishmash of bones from one La Brea quarry. Multiple skulls, a jaw, scapula, ribs, and pelvic bones can all be identified in this photo. Life in Los Angeles was somewhat cooler and moister 40,000 years ago than it is today, as we can tell by examining the plant fossils from La Brea. Many of the plants and animals found in La Brea are identical or almost identical with species that still live in the area  or that would be living in the area had Los Angeles not gotten in the way. Yet a number of the large animal species found at La Brea are no longer found in North America: native horses, camels, mammoths and mastodons, longhorned bison, and saber-toothed cats. In today's ecosystems herbivores are much more abundant than carnivores. It is therefore curious that at La Brea about 90% of the mammal fossils found represent carnivores. Most of the bird fossils are also predators or scavengers, including vultures, condors, eagles, and giant, extinct, storklike birds known as teratorns. Why is this the case? If a pack of carnivorous mammals were to chase a lone prey animal into the tar pits, both predators and prey would become trapped. This would not have to be a frequent occurrence  an average of one major entrapment every ten years, over a period of 30,000 years, would be sufficient to account for the number of fossils found at La Brea. Scavenging animals, drawn to feed on trapped animals, would have a chance of getting trapped themselves. This would explain the preponderance of carnivores and scavengers. Click on any of these photos to see enlargements. 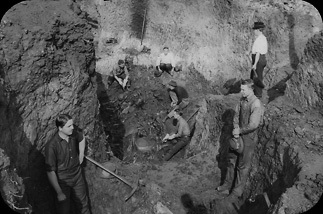 Top left: A number of workers excavate one of the quarries. 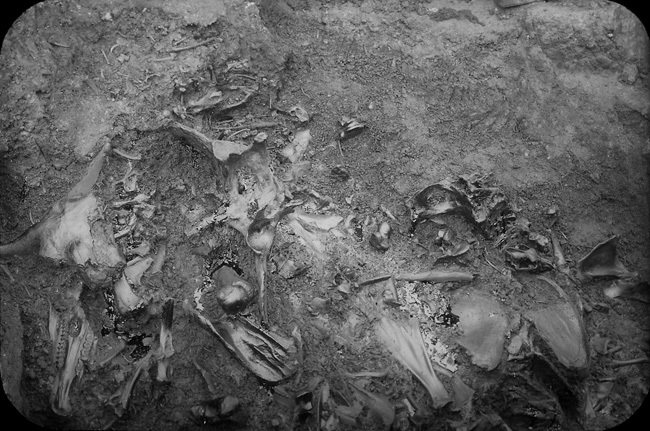 Top right: The same array of bones in the photo shown above but from a different angle. Note the fine jaw and bison skull at left. Bottom left: An innocent looking pond is actually a death trap. Rings on the water reveal that asphalt is bubbling up from below. 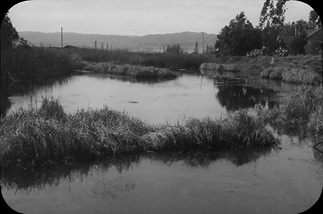 Note the oily film on the water's surface. 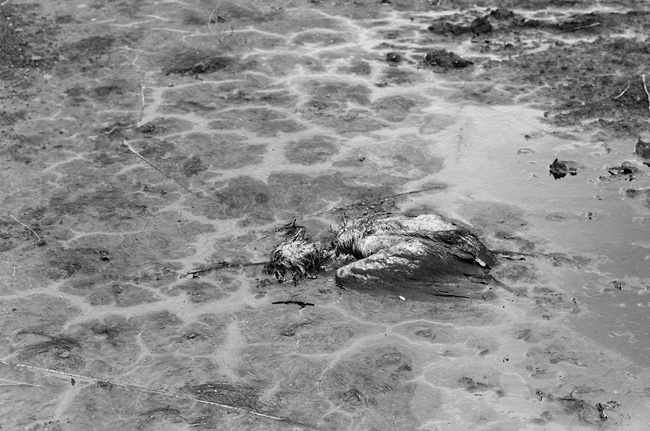 Bottom right: A bird caught in the gooey asphalt may one day become fossilized. Pictured below are the skulls of a couple carnivores from the La Brea tar pits, housed in the University of California Museum of Paleontology collections. 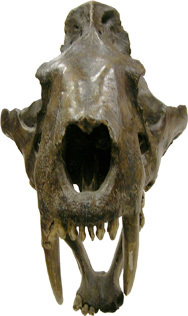 Smilodon, the most famous of the saber-toothed cats, is the second most common fossil at La Brea. Literally hundreds of thousands of its bones have been found, representing thousands of individuals. It was first described by Professor John C. Merriam and his student Chester Stock in 1932. Today, it is the California State Fossil. 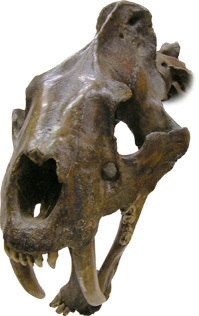 But Smilodon was not restricted to California; it ranged over much of North and South America. 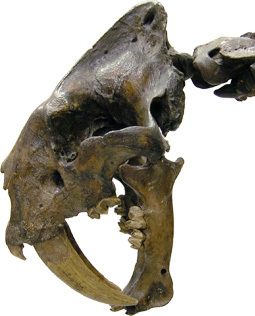 Find out more about Smilodon and its kin at What is a sabertooth?. 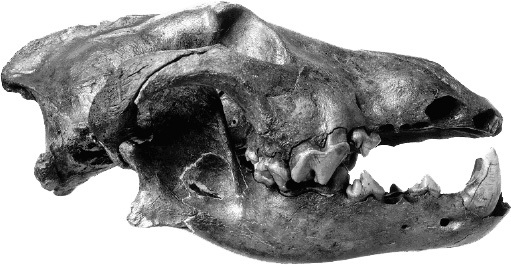 This fossil was originally described as the species Canis milleri, but further study has shown that it is a subspecies of C. lupus, the gray wolf. In the Pleistocene, gray wolves shared the region with C. dirus, the dire wolf. Gray wolves had the largest natural range of any mammal species except for Homo sapiens; at one time they were found in every habitat of the Northern Hemisphere except for deserts and the tropics. Today, the gray wolf has largely been exterminated in Europe, Mexico, and the United States (except for Alaska). Harris, J.M., and G.T. Jefferson (eds.). 1985. Rancho La Brea: Treasures of the Tar Pits. Natural History Museum of Los Angeles County. The artist William Gordon Huff sculpted several of the animals from La Brea for the Museum of Paleontology's exhibit at the Golden Gate International Exposition of 1939 and 1940. Find out more about Huff and his sculptures. 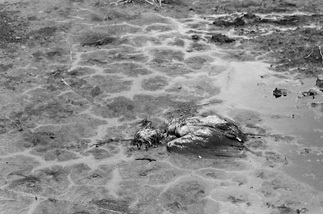 See a page about the La Brea Tar Pits at the Paleontology Portal. See the Wikipedia page on the La Brea Tar Pits.